MAIN ST. Arts Festival was named one of Fort Worth's Best Local Events by Fort Worth Star Telegram's Fort Worthy Awards. Nominated and voted by the readers of the Star Telegram, hundreds of local businesses and events were nominated for various categories and awards. Pictured here are Laura Sanchez and Cathy Wilson. These dedicated event management team volunteers help make this annual event not only possible, but extraordinary! Thank you to all who voted for MAIN ST. as your favorite local event! This marks 27 total awards received for the 2018 MAIN ST. Fort Worth Arts Festival. Just last month, the festival was awarded the prestigious Zenith Award through the Kaliff Zenith Marketing Awards Competition. This award is Texas Festival and Events Associations’s (TFEA) number one, best-overall award, and is judged based on event promotion and involvement of programs such as volunteers, education, entertainment, and community outreach. 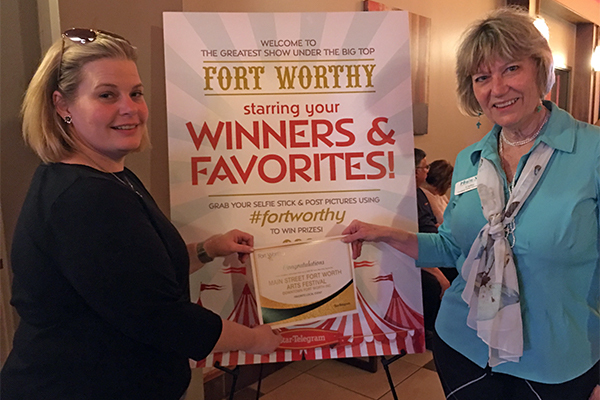 MAIN ST. Fort Worth Arts Festival also received first place in Best Event Video Promotion, Best Volunteer Program, Best Promotional Poster, Best Organization Website, and Best Social Media Campaign at this year's TFEA Conference. We can't wait for next year. Save the date: April 11 - 14, 2018!